David J. Spigelmyer is president of the Marcellus Shale Coalition. He spoke with The State Journal about the present and future potential of developing Marcellus Shale. THE STATE JOURNAL: What is the short- and long-term outlook for development of the Marcellus Shale? 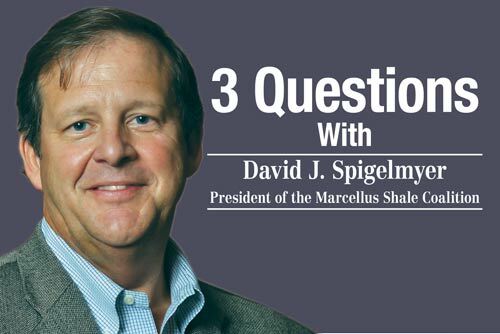 DAVID J. SPIGELMYER: It is incredible to see how far we’ve come in a short period of time with shale development across the Appalachian Basin, but what’s even more exciting is where we are going. According to the U.S. Energy Information Administration (EIA), the Marcellus accounts for nearly three-quarters of the nation’s natural gas production growth over the past few years. In Pennsylvania, we’ve gone from producing 25 percent of Pennsylvania’s demand for energy for natural gas in 2008 to becoming the nation’s second largest natural gas-generating state. In 2012, for the first time, West Virginia became one of the United States’ top 10 natural gas-producing states. The Marcellus alone is heralded as the eighth-largest natural gas production area in the world. All of this advancement, including having an abundant supply of ethane and other NGLs here in our region to help drive a manufacturing renaissance, is bringing — and will continue to bring — a growing number of jobs to the region. Consumers are clear winners, too. Thanks to expanded shale production, U.S. households — according to a recent Boston Consulting Group analysis — are poised to save $1,200 annually in energy costs. TSJ: Where are the primary markets for gas and natural gas liquids for the Marcellus Shale now, and where are the likely to be in five years? DS: Home heating and power generation are primary sources of natural gas demand. EIA predicts that by 2035, natural gas will be used as the primary fuel for power generation. And today, roughly half of all U.S. households are heated by natural gas. These consumer and energy security benefits are being broadly realized, too. More of the natural gas being used in the mid-Atlantic and New England states is now coming from the Marcellus, as opposed from the Gulf Coast or foreign imports. The growing pipeline infrastructure enables us to get gas to market — heating more homes and businesses during this record-setting winter and putting more vehicles on the road that are powered by cleaner-burning compressed natural gas (CNG). Potential cracker plants in the region provide another important outlet through which ethane is refined into a critical manufacturing building block. According to the American Chemistry Council, in fact, shale development had led to more than $100 billion in announced U.S. chemical industry investments, ranging from new factories and expansions. It’s incredibly exciting to see these shale-related manufacturing benefits take hold, especially as our national economy struggles to regain its footing. Shale also has an important role to play in the global marketplace, too, which will allow us to continue to drive down our trade imbalance and strengthen partnerships with key international allies. By some estimates, North America will account for about 15 percent of global liquefied natural gas (LNG) supply by 2040. TSJ: What is the next big development in Marcellus Shale? DS: As technology continues to improve and we see more and more innovations in all phases of shale development, we are looking ahead with growing anticipation for what is coming next. With so much happening on all fronts, it’s difficult to quantify one development as the biggest. The downstream possibilities are really endless, and the potential for ethane cracker plants in the region is exciting. The manufacturing renaissance in our region and across the U.S. has already begun, and that major downstream benefit will continue to flourish. The market for tubular pipe and the expertise our region can offer is just one example of many ways the manufacturing industries will thrive as shale production continues to grow. With all that said, regulatory certainty is crucial. In Pennsylvania, we are deeply committed to continue working closely with elected officials and stakeholders toward policies that will make certain that we protect our environment while also ensuring that we keep a competitive business climate. Our industry, and our strong network of grassroots supporters, is squarely focused on being good neighbors and stewards of our environment. That’s the only way to make possible the shared benefits this resource is bringing our region, the nation and the world.